I love the accountability that sharing the details of our personal finances provides. I was a little nervous when I started posting our financial details for the world to see, but my readers have been gracious and kind. I’m so thankful to have encouraging readers who are not overly critical or judgmental. Without further ado, here is what we earned, spent and paid off our debt during the month of September. 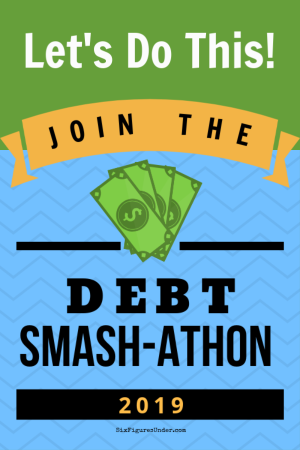 This month we paid $2,392 toward debt. That’s higher than it’s been in a while, which feels good! Another bonus is that we finally got our total remaining debt to under $90K, which is exciting (and seemed to take forever)! Our total net income for September was $4370. For those who are new here, this is income that won’t be spent until October since we live on the last month’s income. Regular Income: $2969– This is Mr.SixFiguresUnder’s current take-home pay. For more details about his pay see here or here. Etsy Income: $326–My Etsy shop was on the slow side this month, but I didn’t mind. I’ve been really busy and haven’t been feeling great, so I didn’t mind a bit of a break (though I still have orders in my queue). Blog Income: $1075– This is my net income. I have taken out my blogging expenses, which were rather large this month since I purchased tuition in a blogging course that I’ll be taking over the next few months. Not all of this is cash income. It also includes referral credits from all of you who signed up for Republic Wireless after reading my experience and review. That will cover our cell phone bills for quite a while. We love our phones and our $10/month phone plans, and many of you have joined us. Tithing–$449 One of the expenses that we never cut out of our budget is a 10% tithe on our income. Other Giving– $20 Includes other charitable donations besides tithing. Mortgage/Rent– $0 We save a lot of money by living in my in-laws unfinished basement rent-free. It may not be a pin-worthy home, but it’s a huge blessing with some great benefits. Utilities– $0 Most of our utilities are included in our free rent. We do pay $30/month for extra Internet bandwidth (our Internet options in the boonies are few and expensive), but that comes out as an expense from blogging income, which is deducted before it gets to our family budget. Republic Wireless– $22 We are on the $10/month plan for each of our phones (see my Republic Wireless Review here). With tax it comes out to $10.89 each. Our phone bill this month was covered by the referral credit I mentioned in the income section. Health Insurance– $114 Brought to us by the Affordable Care Act, you can read the details of our plan here. Car Insurance– $97 We have two ’97 vehicles. Renters Insurance– $14 We were sure glad to have renters insurance (and car insurance) when Mr. SixFiguresUnder’s car was broken into recently. Food– $299 To be more precise, it was $299.75. How’s that for barely staying under our $300 food budget?! We did our big shopping trip earlier in the month than usual, so we had to be extra careful near the end of the month. Gas– $430 It’s nice to be under this month since last month we were a little over. So much has to do with the timing of the fill ups, considering filling up the van costs over $60. Gas prices are also going down. Here it’s about $3.49 now. Clothing– $120 I mentioned the sweet deal I got on a brand new suit for my husband ($101). I haven’t tailored it yet, but I plan to have it done in the next month (hear that Honey?). I found snow pants and jacket sets for my 5- and 6-year-old at a yard sale. They were in beautiful condition and $5 per set. You know I hate to have to ask about garage sale prices, but it was worth it this time. After she told me the price and I was still looking at them, I heard her friend whisper to her that the price was way too low. I already knew that though! I got a couple of long-sleeve kids shirts at the thrift store and a dress for my daughter with my $10 sign-up credit on ThredUp, a site that sells gently used children’s and women’s clothing. Household– $32 I love doing family theme costumes for Halloween. I won’t tell you what we’re doing this year, except that it requires 3 pig noses. In years past I may have been up for crafting my own pig noses, but this year I was thrilled to get them on BuyCostumes.com. I was impressed at the prices and selection. The pig noses were even cheaper than the ones on Amazon and I got free shipping through ShopRunner (thanks to American Express). I also got some pirate hooks and patches to add to our dress up bin. I found a few other treasures on our yard sale excursion like a set of like-new twin sheets for $3. I also bought new water bottles for the kids’ lunch boxes. We save so much money by sending them with water instead of juice boxes. Fun– $20 I took the kids to a little community carnival on a Saturday when Daddy was busy. I also used some fun money for a mom night. I bought myself dinner at In-N-Out (including a shake and fries!) on my way to an inspirational General Women’s Meeting. Lawyer Marketing– $0 So glad to be done with that ad contract! Law Practice– $319 In addition to the monthly subscription to my husband’s law practice management software, he signed up for Continuing Legal Education credits. He has to have a certain amount completed by February. While he can get some free credits through webinars, this one will actually apply specifically to his practice area and really be beneficial. Car Maintenance– $407 Hooray for no more squeaky brakes! We finally got the problem fixed that we found out about on that bad day back in August. It turned out to be less than expected because of our loyalty card (which pays for itself just in oil changes) and a coupon we received in the mail. We were excited that they “stacked” both offers! Emergency Fund– $200 It feels good to contribute a bit to our emergency fund. Right now it’s at $4,801. For years we have used our Capital One 360 saving account (formerly ING Direct) account for our emergency fund. We love the convenience of an all online account, a savings account that has no minimum, and easily transfers to their fee-free checking account or any other checking account. Not only is it free to sign up, but they give you a bonus for signing up! How did your finances go in September? Note: Some links in this post are affiliate links. For more info check out my disclosure page. « Can You Freeze THAT? Congratulations on the under 90k achievement!!! Soon enough you will have paid off more debt than you have remaining. I feel for you with the law practice fees! I only recently accepted putting bar dues and continuing education credits in our yearly budget. I don’t know why but it was just one of those expected costs that always slipped my mind. But thanks to getting organized by reading your posts I’m monitoring our expected purchases and expenses! Thanks for being so open with everything, I know it’s certainly helped me as a reader see many things I was missing in budgeting! Wow, what a fantastic month you’ve had!! Good for you for sticking with it. My financial month sucked. You can read about it on my blog. I’ve tried to be open about my finances too (just started, actually), and it’s eye opening. I’m hoping to make some improvements and change some things up! I did ok — the usual Murphy-ish things happened, but I still came in around where I’d intended to be on spending and, for the first time in three months of YNAB budgeting, didn’t have to “borrow” from next month’s discretionary money to get through the last week of the current month. So I’m starting October with an actual full budget, for the first time! I’m excited to see how things go with that. That’s great Cecilia! Starting October out with all a full budget is awesome! Big congrats! So awesome! I recently got my FedLoans under 100k and it felt amazing. Sallie Mae is still holding strong at 19k from 20k, which is from undergrad almost 7 years after graduation. My finances from Sept were the same, but from October things will definitely be turning around. I’m so excited to start making serious progress. 80% of my paycheck will go toward my loans, but seeing them melt away makes it all worth it! Congrats on the under 100K milestone!! And putting 80% toward your loans will be amazing! What do you sell on Esty? Do you have a link on here to your shop? I sell cupcake toppers and banners for birthdays and baby showers. My shop is SimpleSensations.etsy.com. I have a whole blog series on selling on Etsy. You can find it on the sidebar or under “earning extra” at the top. You’re such a student loan repayment inspiration! My husband is still in grad school, but I made our first payment on his student loans this month. Since we don’t have required payments, yet, it was small but it went to the principle on one loan group. My goal is focus on that particular loan while I can and to get the principle down before interest kicks in. Maybe it’ll be paid off before required payments start! That’s wonderful Jennifer! I wish we had started tackling our debt while we were still in school. That will be awesome to make major headway on the principle before interest kicks in! Sweet! Congratulations on being under $90k! My student loan debt repayment was pretty good this month, but it could definitely be better. I’m reading your site like crazy, looking for new ideas. Thank you! Good for you! Speaking as someone(s) who have been there/done that – just keep doing what you’re doing. You will get that debt paid off. Spouse and I had HORRIBLE student loan debts, we’ve lived below the poverty level, blah, blah, blah – and now we are very close to paying off our mortgage on a very nice ($500K house) after we have put all of our kids thru college debt free. Living in an unfinished basement rent-free – omg! we so would have loved to have had that opportunity. Don’t you give up. Don’t even look back, just keep pushing forward. Sooner than you know you will be debt free millionaires! Best of luck! Thank you for the kind words of encouragement Jim! It’s exciting to hear your success story. That’s awesome that you’re getting close to paying off your mortgage after making it through the student loans and putting kids through school! Congratulations on getting the law school debt under $90,000! Thanks Linda. We’re excited to have reached that milestone and hope that getting under $80K will come even more quickly! Wow, what an open and honest review of your finances! I have started posting at the beginning of the month about how we are paying down our mortgage and different ways that we are doing that. Will have to take some time to check out more of your blog! Thanks Lydia. That’s great that you’re posting updates on your mortgage goal and sharing your creative ideas! How very inspiring! I am new to your blog and am amaze at your grocery budget. I will be following your journey to repayment. I am excited for you and your progress. Thanks for the encouragement Fleurztael!